I was looking for something to read the other day and wanted something like the Argeneau series. When I couldn't find anything similar that I hadn't already read I decided to re-read some of my favorite books from the series. This book is about Etienne Argeneau and Rachel Garrett. Etienne is the youngest son of Marguerite Argeneau. He makes video games. Rachel works at a morgue. Someone is trying to kill Etienne and he gets sent to the morgue... twice. 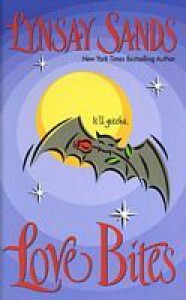 As with most of the Argeneau books this one is humorous and fun to read. I always feel bad for the immortal when they are trying to figure out how to get their lifemate to accept them but it's usually pretty funny along the way. Especially when Thomas slips them some sweet ecstasy drinks. "You are the most gorgeous corpse I've worked with." "Really?" Etienne smiled. No one had ever told him he was a gorgeous corpse before. "If I had taken the time to imagine what the man I loved looked like and the qualities he would have, you would have been who I dreamed of."